Like a scalding push-pop of danger! I am saddened that so much of the delicious vegetation of summer goes uneaten around here. We’re not gardeners, and the awesome stuff that is either given to us or picked up from the ‘overflow of bounty’ table at church is in danger of spoiling before we get to it, so I limit what we take home. 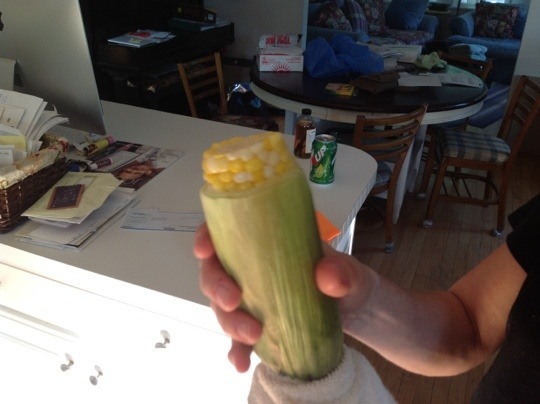 We’ve done a pretty good job with the corn, though. Especially since I found the miracle cooking method. 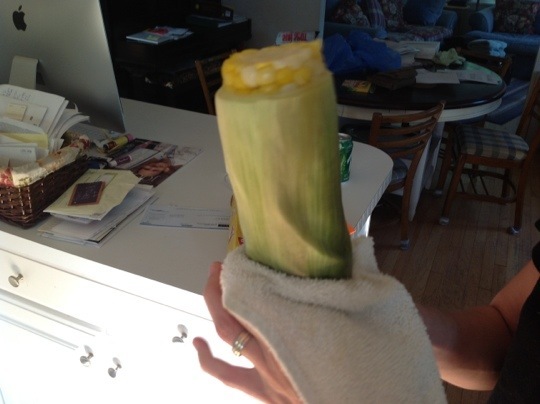 Slap the whole ear of corn in the microwave for four minutes (7-8 for two). After the beep, take it out and cut it off at the biggest point. Yum! Corn on the cob is hard to find here -- I really miss it! I too will have to try this. It seems so easy. I just had corn on the cob over the weekend & I always make my in the oven. I don’t know why, but I hate working with the big pot.